As I was scanning my Twitter feed this morning, I noticed the NHL's public relations team shared via Twitter a NHL Uniform Guidelines graphic and stated that these rules would be strictly enforced this year. When I sat down to write up this blog post, the tweet was gone. Not sure why they deleted it, but I grabbed everything beforehand so I can still share it here with you guys. The reason is I thought some of the rules were interesting and if it's being "strictly enforced," does that mean a player can now sit in the box for an improper uniform? Part of what struck me as odd is that the size of the graphic made the text almost impossible to read. (That reason for removing the tweet could've been that simple. It might go back up later with a larger graphic.) But I was able to read and transcribe it. Rule 9.1 Team Uniform: All players of each team shall be dressed uniformly with approved design and color of their helmets, sweaters, short pants, stockings, and skates. Altered uniforms of any kinds, i.e., Velcro inserts, over-sized jerseys, altered collars, etc., will not be permitted. Any player or goalkeeper not complying with this rule shall not be permitted to participate in the game. For violations, refer to 9.5. Rule 9.5 Protective Equipment: All protective equipment, except gloves, headgear, and goaltenders' leg guards must be worn under the uniform. Should it be brought to the attention of the Referee that a player is wearing, for example, an elbow pad that is not covered by his jersey, he shall instruct the player to cover up the pad and a second violation by the same player would result in a minor penalty being assessed. Two minutes for showing your pads. Rule 9.5 governs all protective equipment, including pants. Players are not permitted to tuck their jersey into their pants in such a manner where the top padding of the pant and/or additional body protection (affixed to the pant or affixed to the Player's body) is exposed outside the jersey. The back uniform number must not be covered or obstructed in any fashion by the protruding pads or other protective padding. Is it just me, or was this written for Alex Ovechkin? Any garmets/protective equipment which is exposed above the neckline of the jersey must be a solid color (matching the team uniform) and without any stripes, commercial name and/or exposed logo identification. Clubs have the option to expose a specified team logo on the neck area. Rule 9.3 Player's Jersey: Sleeves must extend into the cuff of the glove. Pursuant to Rule 9.1, Players' pants must be worn in a uniform fashion by all Players. The pants must be one consistent color around andn throughout the leg of the pant. Pant legs are not to be ripped, cut, or torn in the leg/thigh area. Under no circumstances should a Player's sock, undergarment, or bare leg be exposed through the pant. Players are permitted to alter their pants for comfort and performance-related reasons; however, the pant leg must remain one uninterrupted uniform color as to not expose the bare leg/sock in the thigh area. Only approved manufacturers within the NHL On-Ice Branded Equipment program are permitted to receive on-ice exposure during any pre-, regular-, and/or post-season game. A final listing of all approved manufacturers will be sent to each Club Equipment Manager by September 1 in each season. 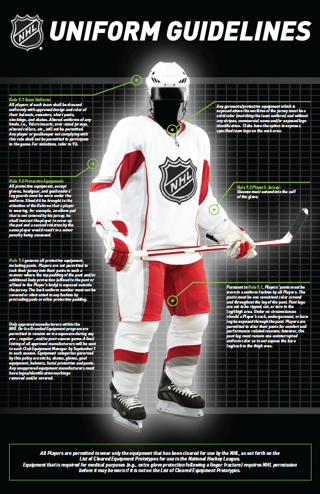 Equipment categories governed by this policy are sticks, skates, gloves, goal equipment, helmets, facial protection and pants. Any unapproved equipment manufacturers must have logos/identification markings removed and/or covered. All Players are permitted to wear only the equipment that has been cleared for use by the NHL, as set forth on the List of Cleared Equipment Prototypes for use in the National Hockey League. Equipment that is required for medical purposes (e.g., extra glove protection following a finger fracture) requires NHL permission before it may be worn if it is not on the List of Cleared Equipment Prototypes. No wonder the graphic was unreadable. That's a lot of text. But there you have it. Nothing scandalous, just some reminders for Ovechkin. He's the only guy I can think of off the top of my head who regularly violates any of these rules.